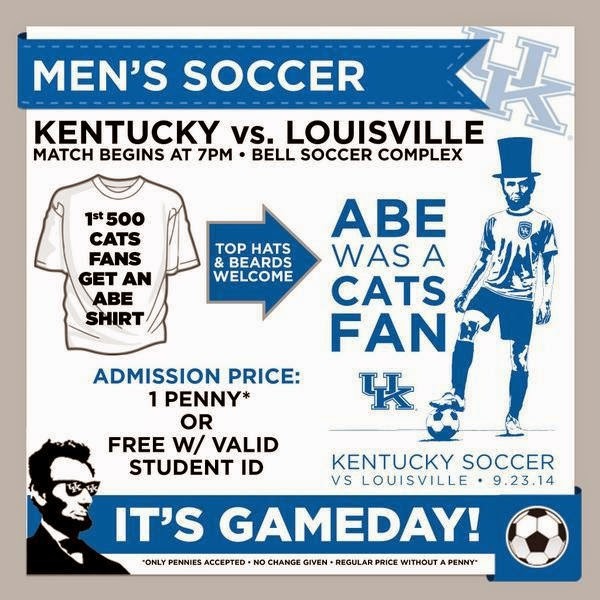 UK Men's Soccer at the Bell Soccer Complex, University of Kentucky. Author's Collection. Soccer isn't really my thing. I'm a football first, then basketball kind of guy. But I'm a fan of the University of Kentucky. And we were playing Louisville. And the proceeds from the ticket sales were going to benefit the Kentucky Mansion Preservation Foundation (KMPF) which is an important non-profit dedicated to preserving historic structures in Kentucky (see comment below). So last night, I went to my first UK Soccer game. And I took my son along; at age six, he is beginning to show an interest in playing soccer. In all honesty, it was the first time I've attended a soccer match (outside of youth games) since the 1996 Olympics group play between the USA and Argentina in Birmingham, Alabama. With Abe on deck, tickets were a penny each and the first 500 fans got a pretty cool t-shirt. We arrived too late to join the ranks of the free t-shirt. 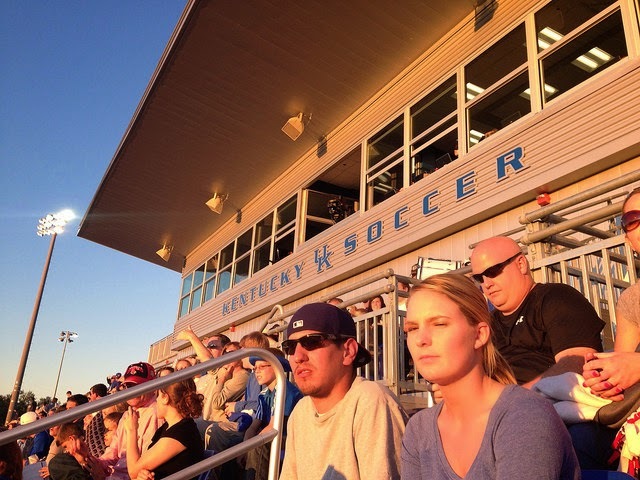 Traffic to the soccer complex was heavy and it was a record attendance for UK Soccer (3,368). Few, if any, followed the other Lincoln suggestion as I saw no one dressed in mid-19th century attire. There was, of course, a nice smattering of blue and white. Big Blue Nation appeared for the Cats sixth home game of the year. The complex itself - the Wendell and Vickie Bell Soccer Complex - was completed in the spring of 2014 and we are now enjoying its first season of use. Nicknamed The Bell, the cost for the facility was $7.7 million and it contains separate facilities for both the men's and women's programs. The facility also shares some amenities (concessions, bathrooms, etc.) with the softball complex. It is a great facility and I'll certainly be back (my son agreed!). The Bell Soccer Complex at the University of Kentucky. Author's Collection. 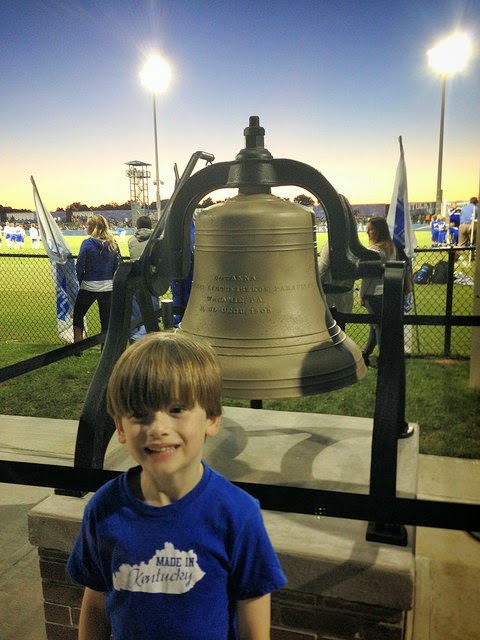 The Lil' Kaintuckeean and the Victory Bell. The Victory Bell rung once during the second half of a losing battle versus No. 8 Louisville, 2-1. The bell at The Bell is rung each time the Wildcats score which is a neat tradition. The bell is located just off the sidelines near the northeast end of the complex. The next home men's soccer game is on October 3, 2014 versus conference rival Old Dominion. N.B. - The Southeastern Conference, SEC, doesn't sponsor men's soccer so UK's team places in Conference USA. The full men's schedule can be found here. And the women's soccer schedule is here. And now for that comment. For those keeping score at home in Lexington's historic preservation struggle, the University and preservationists haven't exactly been on the same page of late. That ticket sales for the UK-UL matchup's Abe Out went to the Mary Todd Lincoln House which is managed by KMPF is a nice gesture. Baby steps?